I was very surprised today when I got a note in my mailbox that I had a package to fetch at the PO. Since I – for once – didn’t wait for anything I couldn’t really picture what it could be. When I came to the PO they handed me a big, square box, by which I could only guess that it was sent from Germany. When I came home I started to realize that it could, might, may be notebooks. But, such a big package just for a couple of notebooks – one for a review and one as a give away. 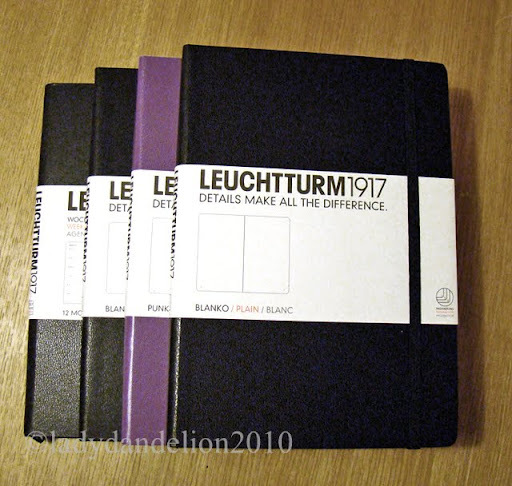 My guess was right – it was notebooks; a bunch of them – from Leuchtturm! Enclosed was a very kind letter from Leuchtturm. I wrote to some note book manufacturers a while ago and asked for a couple of notebooks – I’m thinking of doing a big comparative review – one for me and one as a give away. I didn’t think I had been successful in asking for notebooks for reviews, but I was very wrong. Like all of the Moleskine inspired notebooks they have the traditional elastic closure bonds and expandable pockets, but Leuchtturm 1917 has also have some features of their own: they also have numbered pages, 8 detachable sheets in the end of the books, and stickers for indexing the note book if one should wish to do that. The cover is real nice with a faux leather feel. I will write a full review of it the coming week, but the first test – with a Stipula Ventidue 1.1 mm italic nib – felt very promising. 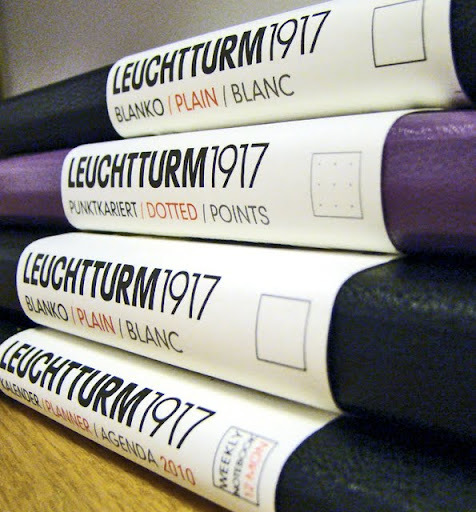 But, before I write that review I am happy to announce a give away with two Leuchtturm 1917 notebooks – one big (21×14.5 cm) and one in pocket size 9×15 cm. Two winners will get one each. To have a chance to win one of the notebooks you must make a comment on this post and in your comment write something about why you like to write by hand – it doesn’t have to be long and/or ambitious – a few words is sufficient. I thus presume that you who visit my blog like to write by hand… The comment must further be posted before 11 pm GMT Sunday March 28. I will then randomly draw two winners and announce them here on the blog the following day. It doesn’t matter where you are – as long as you have a mailbox – I’ll ship it (regular airmail) wherever you are. The winners must then contact me within a week from the announcement – otherwise I’ll draw a new winner. Make comments and spread the word. Good luck – I’m looking forward to read your comments! This entry was posted in fountain pens, Leuchtturm 1917, moleskine, note book, paper, pens, writing and tagged fountain pens, give away, Leuchtturm 1917, moleskine, note book, paper, pens, writing. Bookmark the permalink. I hope I’m not too late! I used to write looooooooooooooong ago! Now that my three kids have graduted from university (yeah! ), I have the time to relax and write on some remote beach! I also recently discovered fountain pens (rookie user), and I’ll need something nice to write in. THANK YOU ALL FOR WRITING SUCH THOUGHTFUL AND INSPIRING COMMENTS. THE GIVE AWAY CONTEST IS NOW CLOSED. I’LL POST THE WINNERS DURING MONDAY. I’M ASTONISHED THAT SO MANY HAVE COMMENTED. I like writing by hand for two reasons. One, because it “feels there”, you are writing on something physical as opposed to something virtual. Though I suppose this is the same for printing. But writing by hand has one thing that printing doesn’t, it shows one’s individual character. The way you write, your handwriting style, etc. Great Looking notebooks , I look forward to your review. Writng by hand especially to someone else, is more personal and crafted – you can tell who a letter is from by the handwriting – Yippee, a real letter, not a bill ! Writing in notebooks is more personal again, requiring pause, thought – there is a flow from mind to paper which often, in my case , creates acts as a catalyst to more ideas. I like writing by hand because it is a ritual that mediates thought and expression. As a student much writing is tedious and forced. I have noticeably become messy with my writing as I rush to write down what the professor says. Although this makes me almost hate writing, as it cramps the hand and is a frenzy at times, the addition of proper tools and paper makes the process much more enjoyable. But why I really like writing is because it forces me to process the very words that I intend on communicating. Understanding is involved in my writing process so when I write something down it is thoughtful, memorable and thus meaningful. I like writing because it is important. The notebooks look great. I’m especially fond of the dots rather than lines or grids. What a great, obvious, simple solution. Official entry on why I like to write by hand: I love the look of the ink beading up before it dries, I love the feel of the nib gliding over the paper, and it feels more permanent than keyboard-based writing. I tried paperless studying before, but found I never went back to the notes I made, which rather defeated the purpose. i’ve never been able to really write fiction any other way but by hand. as others have noted here, it slows the brain down… and yet it also speeds it up, somehow. the intimacy of writing by hand is kind of the complement to the intimacy that reading involves. i love the feel of each pen, and how each pen feels unique; ditto with paper. another benefit for me with writing by hand is that it helps me not take myself/my words too seriously and at the same time it helps me take myself/my words very seriously: i have far more stuff written in my notebooks than i ever type up, and so each time i write i know there’s no pressure, it’s just one of a sea of pages; and yet, each time i write, i’m also taking that time and special care to make it legible for, at least, my own eyes. and of course, when you see your old words written on a page you’re sort of meeting your former self, the one who wrote those lines on that paper. 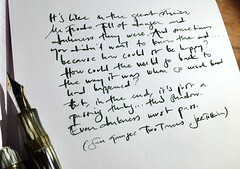 I love writing on good paper with a good fountain pen because it gives me more of a connection to my words. Also, I just love the smell & feel of writing tools! I like to write by hand because I have tried and TRIED, but I STILL can’t get my laser printer to hold a pen properly!!! I enjoy writing by hand. It gives a personal feel to letters for family and friends. I bought one of these, blank, to draw in. I draw constantly in books. I was very pleased with this Leuchtturm book. I draw in pen and ink -usually fountain pen and I am a fast drawer. I was impressed that the paper kept up with me, and with the variety of pen nibs – from fine flexible to broad stubbs- that I use. I was very pleased with the book. Then the hurricane hit Brooklyn two weeks ago, blew my studio window in. The only thing totally ruined was this drawing book, and, of course, the drawings in it. It was almost scary how they bled. Some of the inks dissappeared completely. Lukily, that was the only paper ephemera that was totally ruined (I dried the book and have it under a weight to see if it can get usable) But for someone as careful as I am about leaving my drawing books around (I had them moved away from possible leaks in ceiling) this was weird. Would love to have a new Leuchtturm drawing book for my studio. writing with pen and paper is very personal and real… typing on a laptop feels so mechanical and automatic, sometimes even robotic and detached. i love forming letters and seeing how my mood affects the pen strokes. Writing by hand just feels good. The scratch of the pen on paper; seeing the ink slowly dry in shiny, uneven waves; it’s such an intimate experience. You slow down and consider your words; let your thoughts vibrate around you. Computing is process; writing is a craft. While I like the former, I love the latter. A keypad produces many displays but no nuance of connection while typing. A pen, especially a fountain pen is an instrument of art and function to enjoy using in an way unique to the idiosyncrasies of its owner. The art of hand writing is timeless: The beauty of using ink and paper to capture moments of thought that can be kept for a permanence of time… Something that never gets accidentally deleted in the process or after… as we all know! As an artist I am perpetually drawing. My favorite combination is my Namiki Falcon pen and a moleskin sketchbook or some book like it. If someone were to look at drawings they could most likely tell who had drawn them by the quality of line. The same is true with the written word. A handwritten letter reflects the person that wrote it. The slant of the letters, the way they connect, the care or carelessness of the letters formation all reflect on the person that is doing the writing. If we look at an e-mail message it is just words. If we look at a hand written letter we can understand the person. I would much rather receive a hand written letter and send a hand written response. I feel the level of understanding, personal expression and communication is far superior. I enjoy writing by hand as it allows me to think about what I am writing rather than to dash something off on the keyboard. Writing by hand is more contemplative and I enjoy writing with my fountain pen. I like to write by hand because I can feel the words flowing out, rather than simply watching them form on the computer screen. Although trivial, I write by hand because it gives me an excuse to one (or more) of my fountain pens on a regular basis. One never worries about paper quality until their brilliant idea is marred by a spidery, feathery mess of ink. I detest inferior paper and am eager to try out one of these beauties if I am so chosen. I like writing by hand because I never really know what I think before I see it written out longhand. I like to write by hand so I can use my fountain pens, of course! I write by hand because holding the pen in my mouth puts my eyes too close to the paper, making the writing blurry, and raises the spectre of tooth-marks on the barrel. Using my feet leads to arch cramps after a line or two. Lacking a prehensile tail, I’ll stick to hands as the only viable writing extremity. …and because of the strange joy or watching the ink shine, shiver, and then sink into the paper as it departs the end of the tines. Sometimes I’ll doodle without meaning just to see that. I like writing by hand because I can do it anywhere. All I need is a pen, a pencil, a notebook, and I’m off. And what I write seems more of myself than typed words — my handwriting is a product of my brain, my hand, my personality. The only thing writing on a computer has going for it is convenience (and the chance to score sweet giveaways on blogs like this!). I like to write by hand because you just can’t doodle, scribble, sketch or scrawl in a word processor; and because typing on a computer in a meeting puts a screen between you and the person you are talking to. Dandelion: First visit to your blog, and now have added to blog list for frequent checks.Very nice offer for the Leuchtturm notebook. Writing with a fountain pen is something I have enjoyed for many years, and though I love the capabilities of computers, when I need to acheive either the sensual, or the carthartic effect, I pick up the fountain pen and write. As a designer I’m driven to communicate visually. I can sketch out an idea quicker with a Montblanc than a Mac. So you’ll always find me with a pen in hand just in case an idea comes my way. As a writer, I enjoy the slower pace of writing by hand in a Moleskin journal. Plus, I love controlling the line quality of the ink as it connects with the page. I’ve said it already, but just want to stress how happy I am for all these comments on writing by hand – thanks for contributing to and enriching my blog. I recently got addicted to fountain pen’s again. When I write by hand the ink is put on paper effortlessly b/c of the smoothness of a fountain pen. Hence I am not worried about forming my letters instead worried more about content. Also, when I hold a precision writing instrument such as a FP, I get in a serious mode and am forced to put something meaningful down. The ideas just flow out of my head through my arm and hand effortlessly. I write by hand because it is a contemplative approach, far more so than the twitching and trembling of hands on a keyboard, and more to the point, far more grounded in the flow and process of writing. And if I’m not thoroughly well grounded in the writing, what purpose does it have ? My first post on your blog, but certainly not my first visit; I find myself fascinated by your penmanship and impressive collection, and impressed at how beautiful the country next door looks on your photos. As for reasons for writing by hand, they are manifold. The tactile element is important, the feel of nib on paper, a nicely balanced pen in the hand. The visual aspect counts as well, of course. A good-looking pen, a nice ink and quality paper can even on occasion make me forget my utter failure at producing attractive handwriting. Happy to see a few fellow Scandinavians here. I’m not so sure that Norway is the little brother to Sweden any more…only in regards to population and area. :) Thanks for adding your comment – I’m thrilled to see how many that have participated already! A really fine gesture – by yourself and of Leuchtturm! I am also very green in the world of fountain pens but I enjoy writing more and more for every day that passes! It is true what they say: writing with FP’s enhances the written word! There are a few elements as to why I like to write by hand. For one, I don’t have to organize a written note into a file somewhere on the computer. For another, I seem to think better when I have a pen in my hand. I think better through writing, and especially when I’m searching for a thesis for a paper or something similar, my thinking works even better when I’m writing by hand instead of typing. And, of course, I can write in all kinds of different colors and make my handwriting look any way I like, instead of having to choose from whichever fonts are on my computer. It’s so much easier. As is doodling. Doodling is very hard to do on a computer. Writing by hand slows down my thought process — it makes me think about the words I am putting to paper, forces me to actually choose my words carefully in order to construct a sentence. Whereas typing is fast, thoughtless, impersonal. Writing by hand with a fountain pen is an experience that invites reflection and allows for expression. It also allows you to digress to the margins of the page to create a parallel commentary or a subtext. My boss says “People are more likely to read a handwritten message than they are a computer print out.” I agree with that. Further, I think a handwritten line has character that a computer-generated one cannot. I love computer-generated illustration & typography too, but if you scan in a handwritten word, even written in ballpoint, at 1200 dpi and zoom in on it, you will see organic beauty that computers can only hope to mimic. I never heard of these notebooks, but they look great. Thanks for the chance. I like writing by hand because it gives the capability of using different nibs and different inks. Very personal compared to the printed words. Write to be understood speak to be heard,read to grow. Wonderful blog and offer, dandelion. What we write in paper will transcend us all. Wow, I really like the look of these notebooks, I can’t wait for your review! I like to write by hand because the experience is more personal. A persons handwriting can tell the reader a lot about the writers personality, even the emotional state they were in when they wrote it. I enjoy using beautiful inks and watching how the ink reacts with the paper I’m using, and feeling the nib glide across the page. There’s no better way to relax at the end of the day than with some nice paper and a pen that feels like an extension of my hand, because it feels so perfect. There’s a connection with the paper, pen and the writer which can never be felt when using a computer. I have been pining after these since I saw them on someone’s Flickr stream. They seem like great notebooks and I love the style. I am anticipating your full review of these notebooks especially with the 1.1mm Stipula! I like writing by hand because of the tactile feel and because watching my hand write the actual word helps me to think through the process of what the content of my writing is going to be. Usually I have a thought to convey and start writing, so while I’m in the process of putting words on paper my mind is working through the syntax of how to express my thoughts. I can do the same thing with a computer, but adding emphasis with pen and paper is so much more satisfying. I am amazed to see this overwhelming response in such a short time. Thank you for sharing your thoughts on writing by hand – very interesting to read your views…and it is more than a week before the contest closes, so I am greedy and hope for many more comments. Feel free to add thoughts in a new comment even if you have already commented. Each person only get one lottery ticket, but I think this is such an interesting subject. Humble thanks to all of the participators! I love the tactile element: using different pens, papers, inks and journals brings a rich variety to the experience that’s simply missing on my computer. And what beats a handful of handwritten letters arriving from overseas correspondents just in time to be read over breakfast? This is a fine contest — congrats to the winner, whoever you may be! I write by hand to engage my whole body in composition. When I type, mostly just my brai and my fingers do the work, but when I write, my arm, shoulder, and the balancing/steadying function of all my muscles get involved. Moreover, because I am shaping and (to an extent) colouring that which I write, different parts of my brain are involved as well. These look great and it’s a brand I’ve never heard of before! Of course I’m not a super stationery junkie so there are a lot of bands I don’t know. As for writing by hand I feel when the ink jumps the gap between the point and the paper it’s the same as a spark flying across a synapse. At that infinitesimal moment something, whatever it may be, transforms from potential to actual. When you write by hand there are no layers to separate you from the action, it is direct and immediate. Those resulting marks will instantly make you joyful, desirous, frustrated, dreamy, anticipative, nostalgic or one of an infinite number rippling emotions. A pen may not be the lone tool that can be used for expression but its elegance in form and function, especially a fountain pen, plays a powerful role in this feedback loop. Great contest, thanks! I like to keep track of our family’s events in journals to hand down to the kids one day. Writing by hand with a fountain pen is such a pleasure…and these notebook photos are pure p0rn!! They look so lovely – especially the violet. I am very tactile. Nothing compares to the feeling of using a good pen to write on smooth, crisp paper. No electronic device could ever come close to such a pleasurable experience. I’m also very sentimental. I keep all of my notebooks and planners from previous years. I love to look back through them and remember what my life was like at that time. Reading my own handwriting brings me right back to that moment when I wrote the words on the page. Good Lord I would be so stoked to try one of these! Wooow you make me jealous. I just started with a new Leuchtturm diary – plain pocket notebook, up until now it behaves very good. I wish their was a store that had all the models in stock including the colored ones. I really like the way hand writing my task lists makes me really think and prioritize my tasks. It is also gratifying to cross out the list with a different fun colored ink. I write by hand for several reasons. The most important one is that I find my thought process is vastly different than when I write by keyboard. There is also a weight I give to my thoughts that is frequently lacking in electronic forms of communication. I also enjoy the physical, tactile sensation of a fountain pen nib gliding over paper. Not to mention the associated rituals, of selection for pen and ink, filling and flushing, and the rest. There is also an unspoken communication with the past – a tangible connection – a physical laying on of hands that forms a connection to those who previously owned a vintage pen. A link to others who have written with pen and ink in the past, and those who currently choose to use this medium now. A vast array of colours and their myriad variations is also a reason. How can one not choose to write in a way that they can express or match their mood by paper, nib, and colour? As a side comment – I have started to love dotted paper. I print my own on decent quality paper. It provides guidelines for writing and sketching without really interrupting the surface of the paper like lines do. Fabulous. I like writing by hand as there is some primal feeling and connection between the writer, pen, paper, and of course what is being written. Just don’t get that same feeling ‘writing’ on a computer…. Numbered pages and a few tear-out sheets are a fantastic addition to this kind of notebook. I’m currently using a Rhodia Webnotebook, which definitely would benefit from such enhancements. Writing by hand appeals to my luddite side. I work on computers a great deal and I relish the times when I am able to just take pen and paper to a table with actual books for research and writing. It’s very generous of you to share the wealth and give away some of the bounty you received. I’ve been wanting to try one of these Leuchtturm notebooks… maybe this will be my chance. As to why I like writing by hand, I enjoy the opportunity to try and improve my handwriting, for one thing. And for another, I spend so much of my time writing on computer keyboards that it’s nice to slow down once in a while and enjoy the tactile sensation of nib on paper. What I write by hand somehow seems more important than what I write by keyboard… even when it’s really not! There is some sort of spark, an electricity that passes from the writers thoughts through their hand into their pen and finally onto the page which makes handwriting such a unique experience. The tactile sensation and feedback from a pens nib against paper transform the simple act of jotting down ideas into a physical act of creation. Writing by hand helps loosen me up for drawing. I can work out ideas and mull over the events of the day (I’m an art teacher) and reflect on how I’m doing in class. Handwriting is the foundation of civilization. Handwriting celebrates the power of human community, of relationships among people. Handwriting reveals and displays a person’s character. Disciplined freedom, said Ray Da Boll of calligraphy. That’s the paradoxical flavor of life in all its dimensions, but handwriting is the seed through which that principle can blossom as civilization. These look pretty nice, though I’m currently enjoying Rhodia webnotebooks for my small journals. The little extras in these are pretty appealing. I like to right by hand because I retain more of what I’m writing (versus typing) and the slower speed allows me to think through what I’m writing. It’s just better for me overall when I’m trying to sort through ideas on my papers, etc. Wow, these look amazing. I’e always liked writing by hand because it gives such a nice experience… One that cannot be replicated by keyboard. And i like to continue to improve my handwriting. The best thing about writing by hand is that you can do it anywhere – at your desk, on your couch, walking in the woods, in a blackout, or right before bed. I like to use fountain pens because I need so little pressure to write with them; they just glide across the paper. Also, there are many wonderful colored inks I have yet to try. Can’t wait to try these! Ever since I “discovered” fountain pens after a friend made a gift and then the real difference that a tuned nib can make — mine all done by Greg Minuskin — I am always looking for reason to write by hand. I used to keep my daily task lists (pretty long for a start-up CEO) via Outlook but now I look forward to the daily draft, crossing off things as they get done and then the “before bed” revisions. I also get kudos for my many hand-written thank you notes but some times I wonder if I write more notes just because I get to exercise my Pelikan M800 or my Pilot Custom 823. LOL!